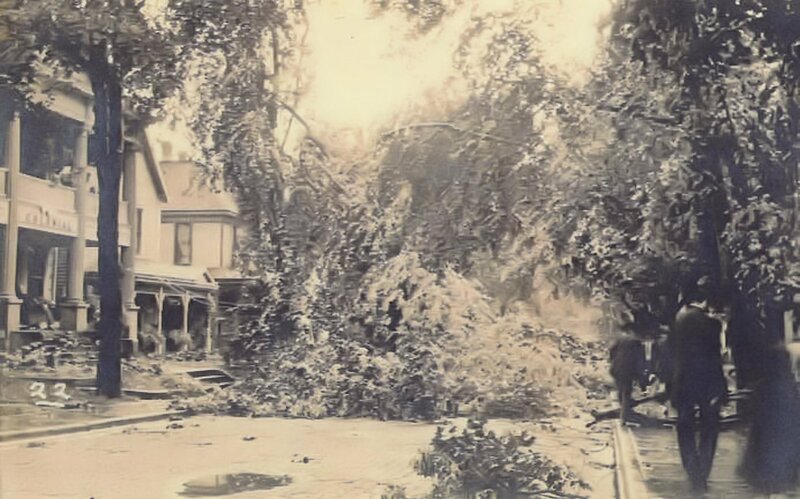 A 1913 picture following a horrible storm. 309 West 10th can be see at the left side. View is toward the Southwest. 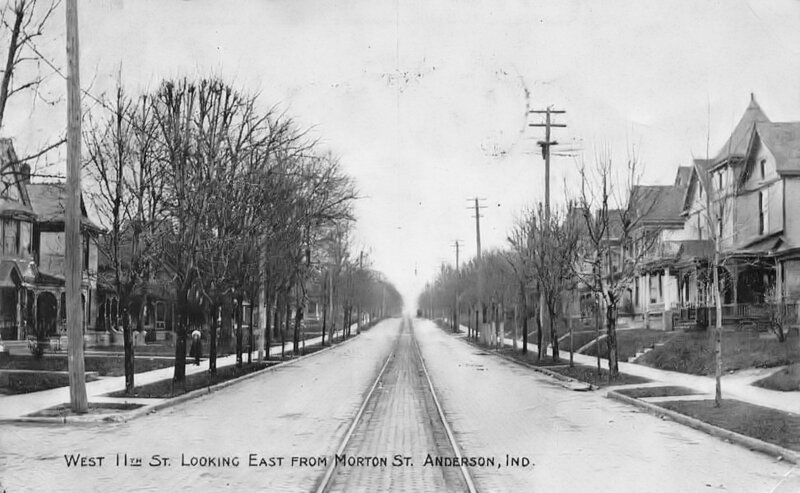 A 1907 view looking East from Morton Street. At left 420 (1st) and 416 (2nd) West 11th - both still standing (2014). At right 421 (1st), 415, 411, 407, and, just across Lincoln, 343. With the exception of 420, the homes visible on the right still stand (2014). 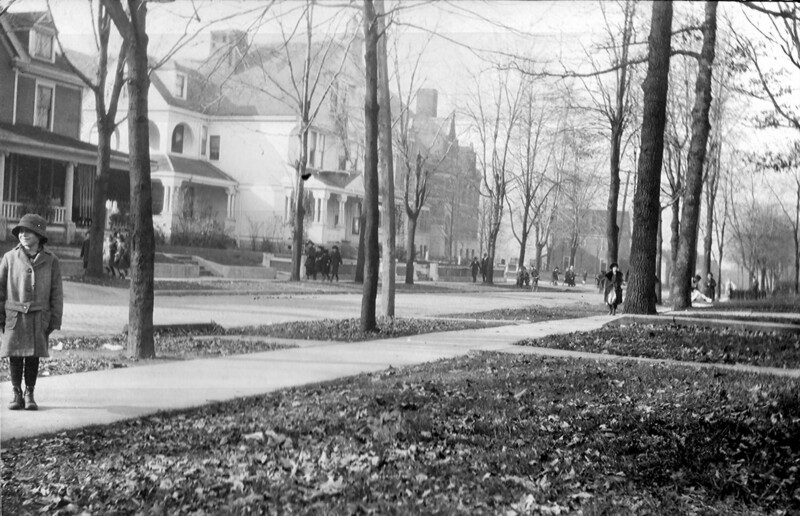 Looking West from a couple homes just east of Chase Street c1901. 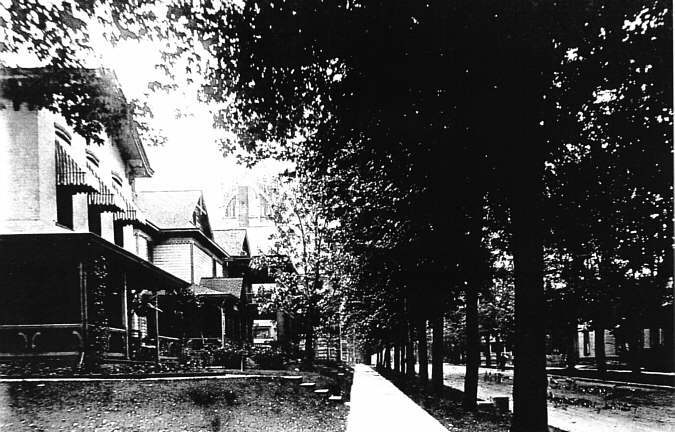 The home at right in 220 W 11th and was brand new (not on 1900 Sanborn maps) - lost along with several other homes to the east for a parking lot. The 1st home at left is 233 W 11th with it's brand new front porch - sadly, this home burned to the ground in December 2013. 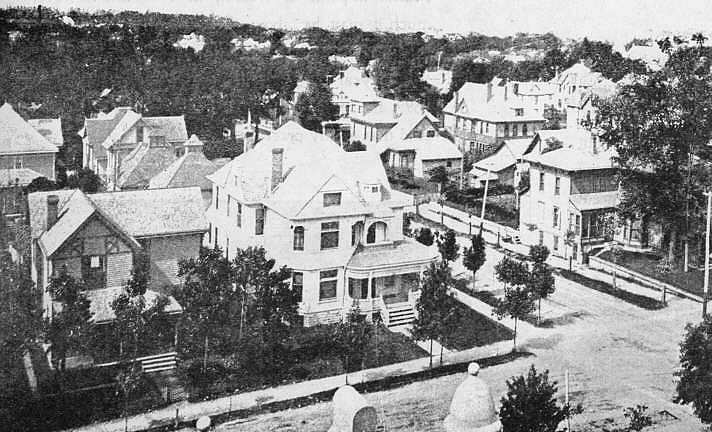 A 1901 view of the 400 block looking Northeast. A group photo of the Hawthorne Club from 1907. 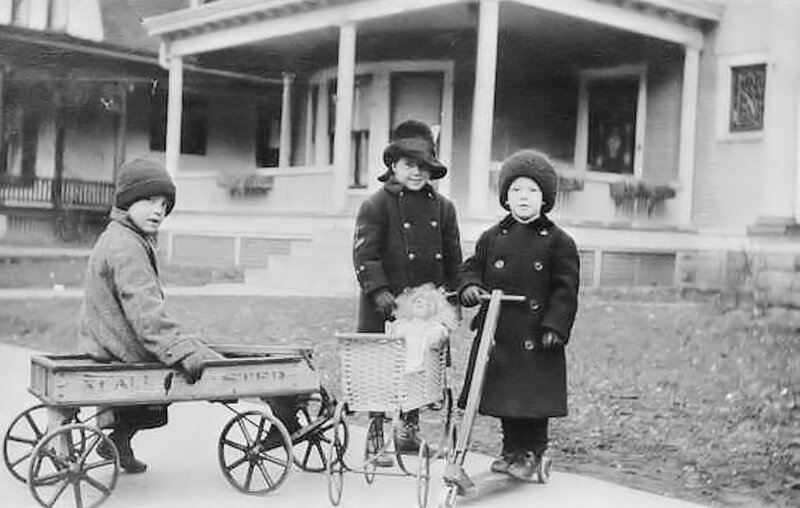 We're not sure what homes this group is standing in front of but the homes appear to be newly constructed. Looking North from West 13th Street in an early 1900s picture. 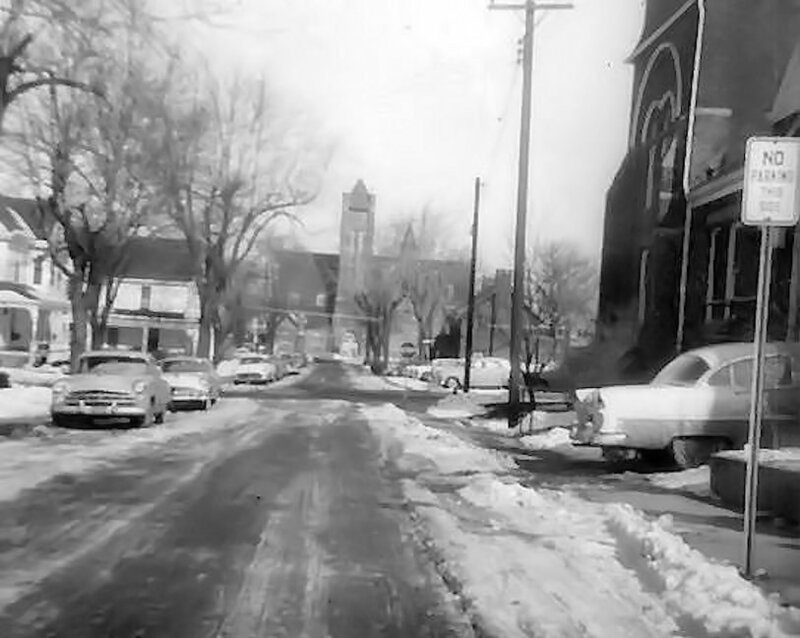 In the distance is the Methodist Church at West 12th and Jackson. 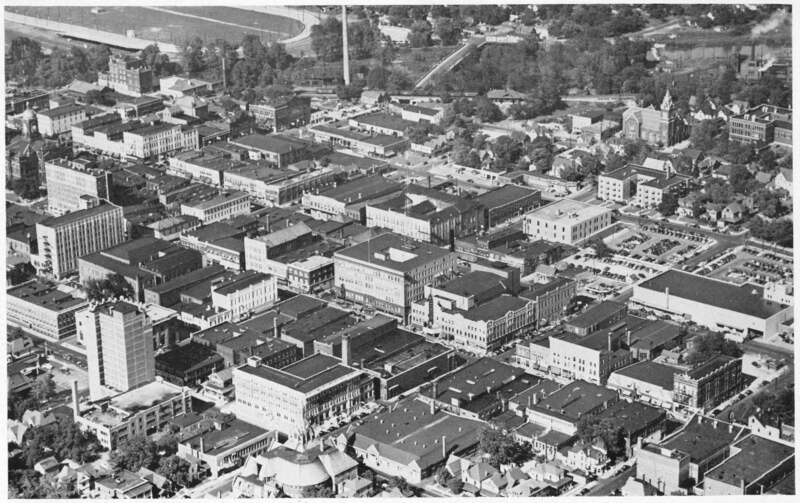 Today, the church occupies all of the property from Jackson to Brown-Delaware and 12th to 13th. 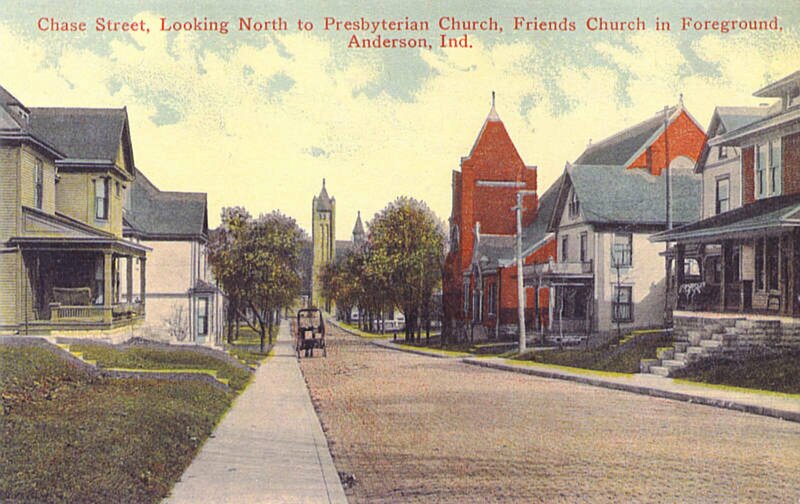 Looking North from West 11th in a 1915 postcard. Central Christian church is at right; Presbyterian church is in the distance. 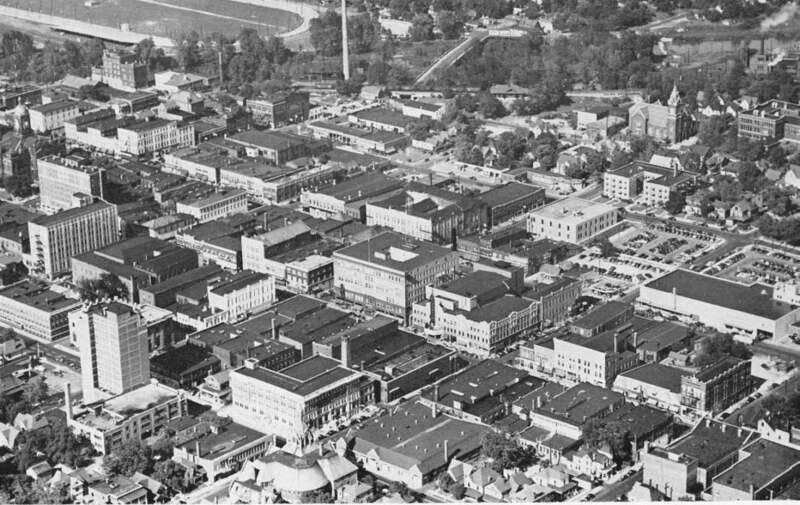 A 1950s view similar to the postcard above. 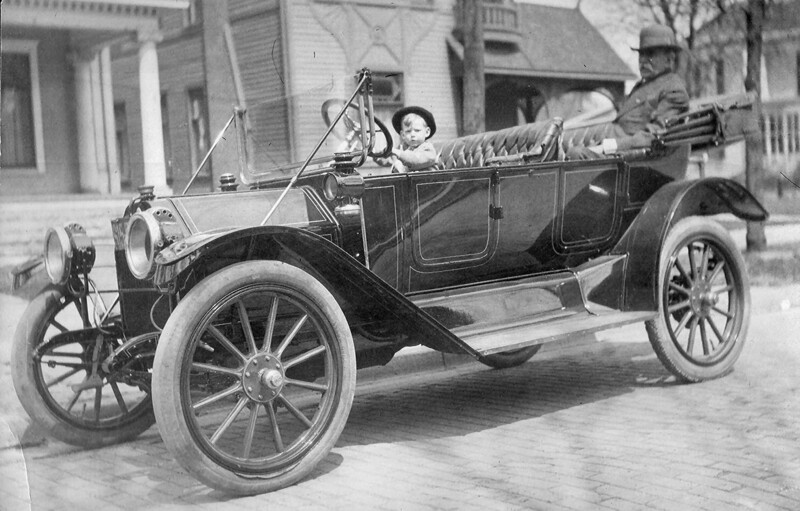 From about 1917 - most likely their first car. 310 West 12th can be seen at the left side. At right is 306 West 12th, believed to have burned down - it was replaced with a brick and tile roofed craftsmen style house - still in existence and in great shape. 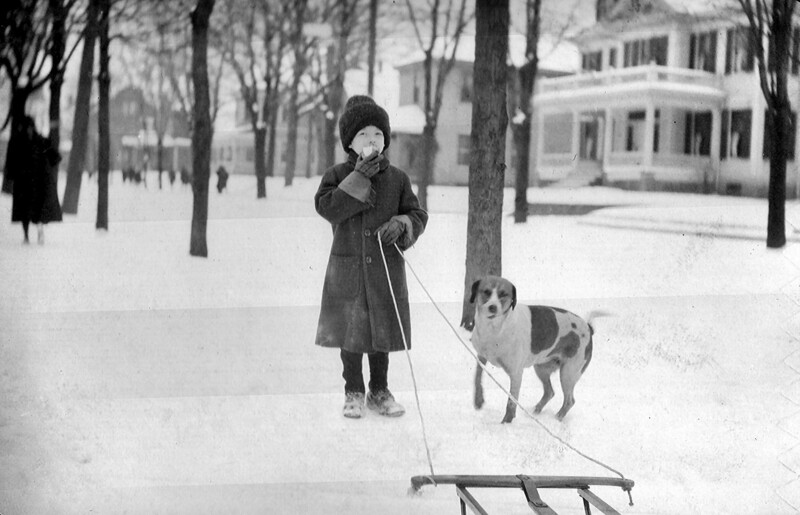 Children playing in front of 314 West 12th in about 1917. The house at the left side is 320 West 12th. Both properties have been restored in the last 10 years. 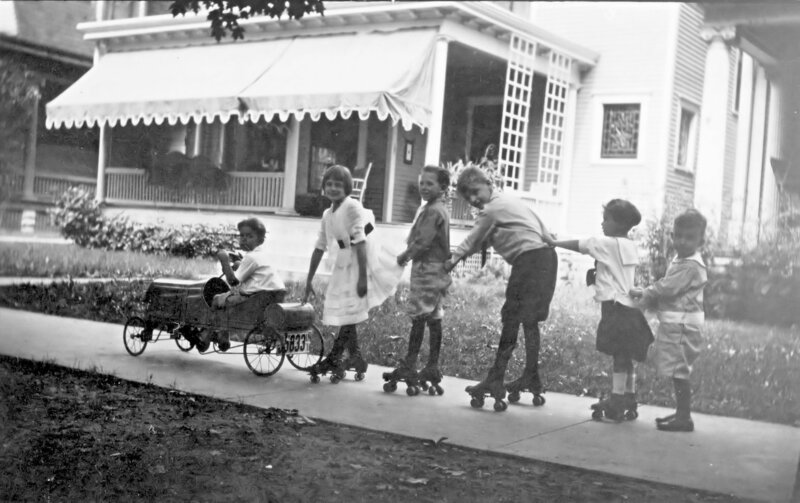 Another picture of children playing in front of 314 West 12th - this time in the 1930s. 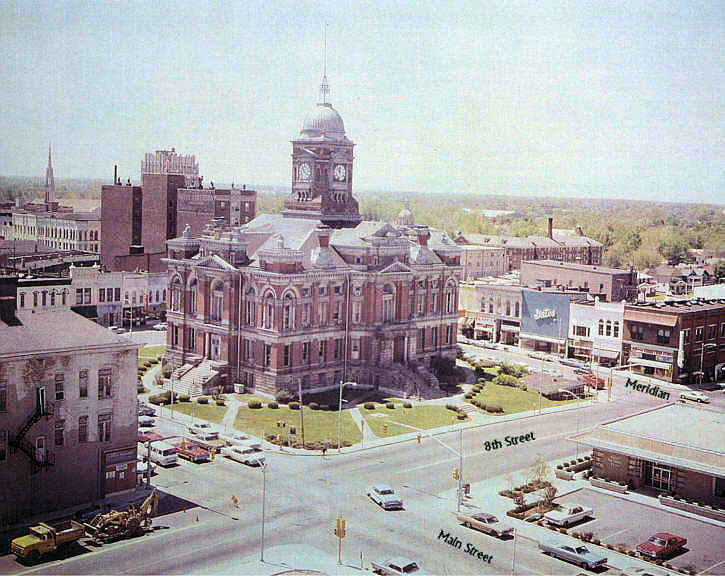 A 1960s view of the old county courthouse and other long lost downtown buildings. 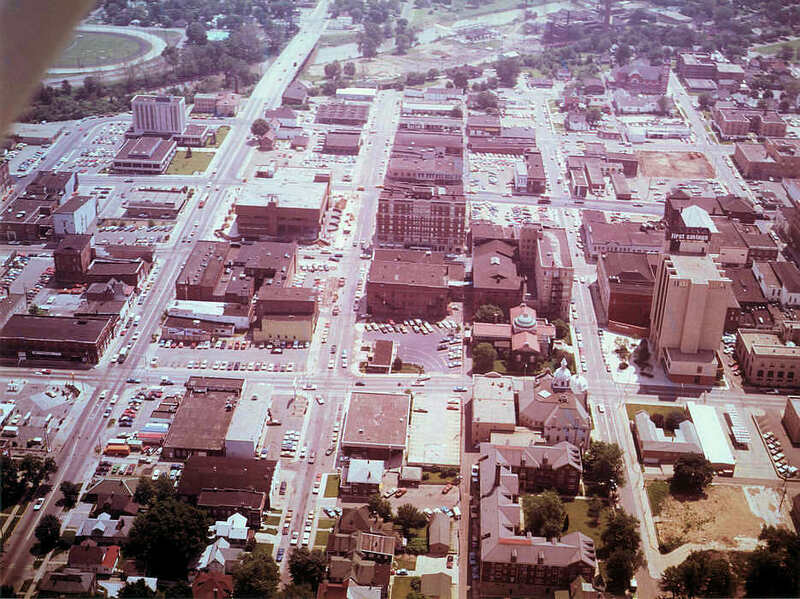 Looking Southwest from the courthouse tower. NEW: click here for a 5MB version of this photo. Use the "Save Target As" option to download to your computer. Then use your favorite photo viewer to zoom in to specific areas of the photo. 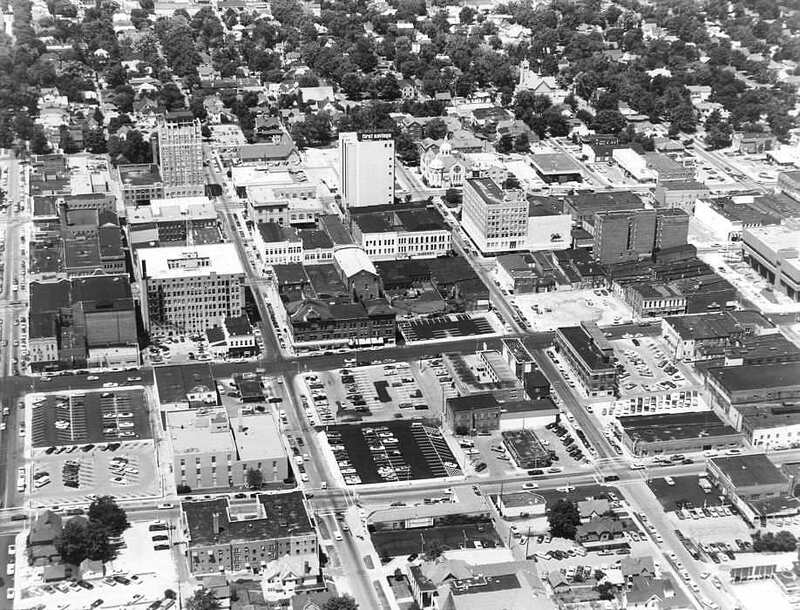 Looking Northeast - the 1st Methodist Church at West 12th and Jackson St. in at the bottom near the center. The Catholic Church is in the upper right. NEW: click here for a 2MB version of this photo. Use the "Save Target As" option to download to your computer. Then use your favorite photo viewer to zoom in to specific areas of the photo. Looking West - the First Savings tower can be seen in the upper middle. NEW: click here for a 5MB version of this photo. Use the "Save As" option to download to your computer. Then use your favorite photo viewer to zoom in to specific areas of the photo. 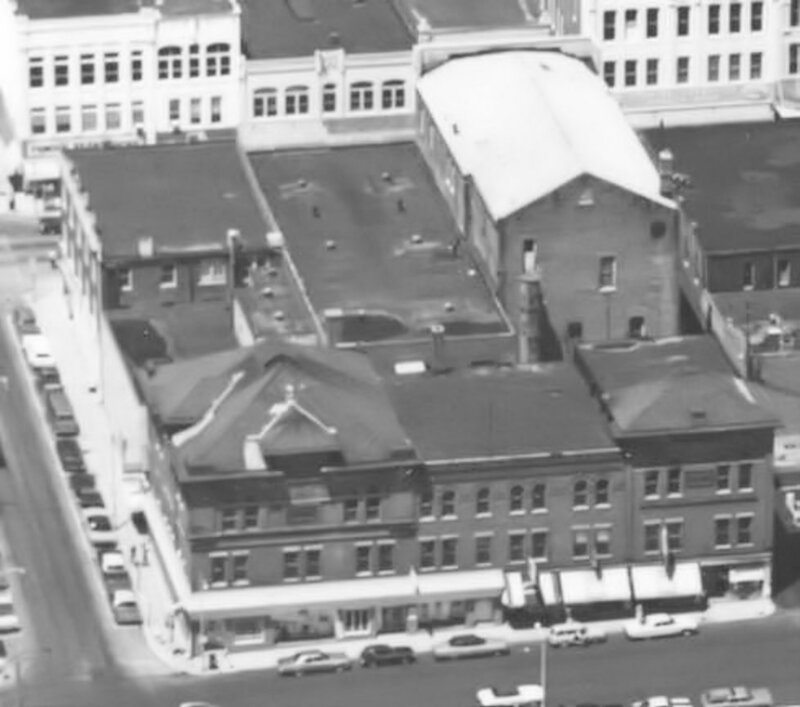 A zoomed in view from the picture above showing the block North of 11th Street between Main and Meridian Streets. This is the current location of the city parking garage. 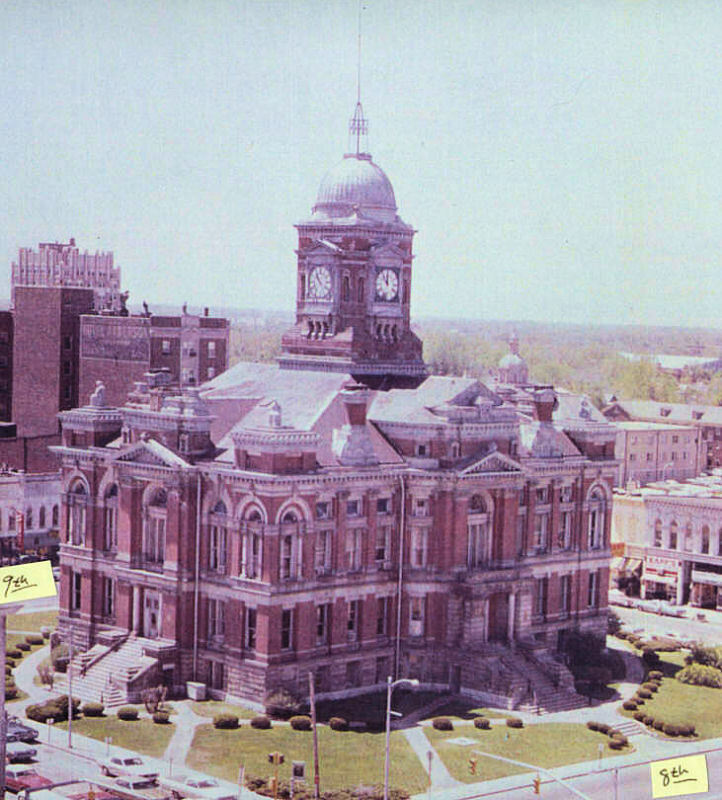 The "new" county courthouse can be seen nearing completion just left and above center. NEW: click here for a 2MB version of this photo. Use the "Save As" option to download to your computer. Then use your favorite photo viewer to zoom in to specific areas of the photo. A 1917 view looking Southwest from 310 West 12th. The white house in the background sat at the corner of 12th & Lincoln streets. In the distance is the former Lincoln Street school. At left is 321 West 12th which still looks much the same today. 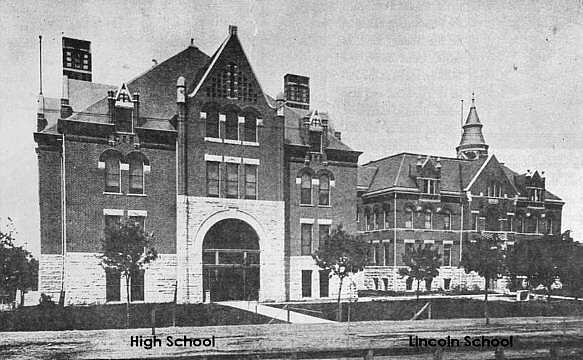 A 1901 view of the High School (left) and Lincoln School (right). 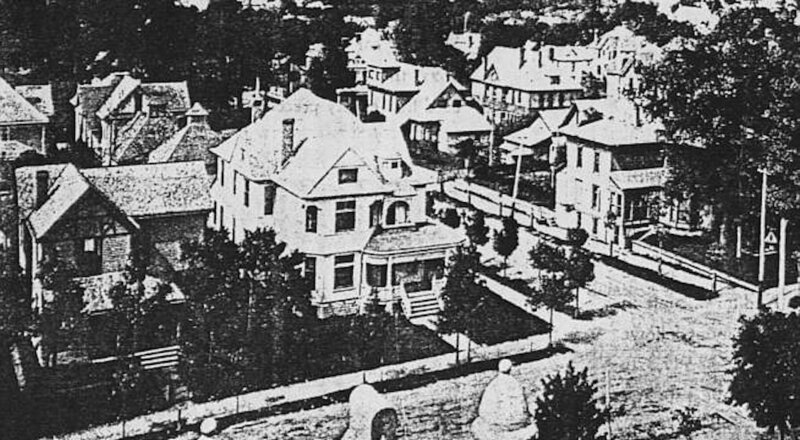 These buildings sat where the present day Wigwam sits on Lincoln Street between West 12th and 14th Streets. 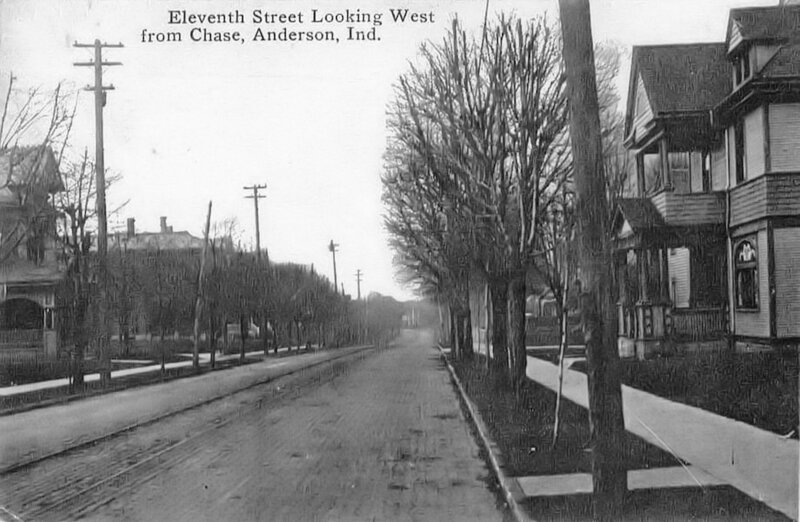 A 1917 view looking Southeast from 310 West 12th. The home at the right is 245 West 12th which still is very much the same today.